Join us for the 2019 BDX Drumline Festival! Open to middle and high school drumlines, directed by Seahawks Blue Thunder Drumline assistant director Tony Sodano. Audience attends free. Each group will have a chance to perform and to participate in a new 20 minute educational clinic. BDX 2019 will end with a performance from the Seahawks Blue Thunder Drumline. This is traditionally the first full group performance of the season for Blue Thunder. Food, drink, and merch will be available for sale. Cash, check and card accepted, all proceeds go directly to the Seattle JazzED Scholarship fund. Blue Note Records: Beyond the Notes chronicles the pioneering jazz label Blue Note Records, the first recording showcase of talents like Miles Davis, John Coltrane, Thelonious Monk, and many more iconic jazz legends. Gorgeous black-and-white archival photographs, album covers, and stirring video of live performances by jazz greats are underscored by a crisp, rich soundtrack spanning the record label’s 80-year history. 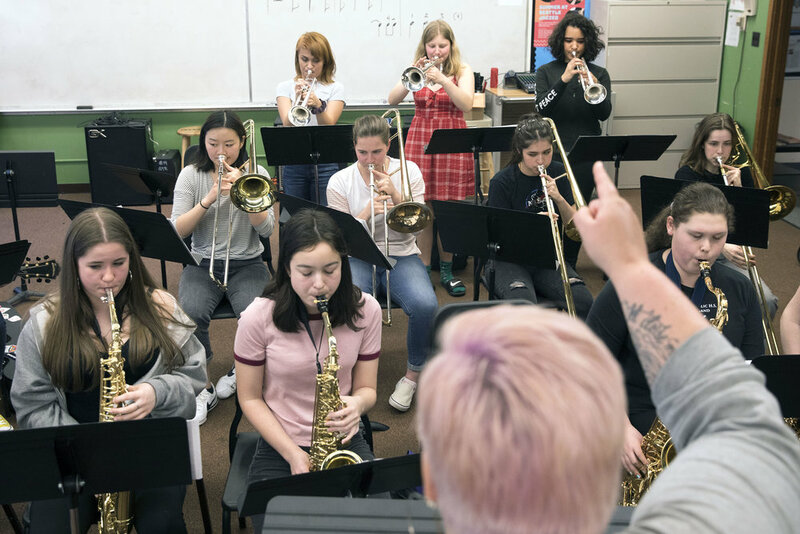 Garfield High School Jazz Program Combo will play a rousing set before the showing. Tickets are $12 - $15 and can be purchased at the Box Office starting at 6:20 day of show, or online HERE. Milo Petersen guitar, Phil Sparks (photo) bass, Dmitri Matheny flugelhorn. Standing room only so get here early for this next installment of EarthToneSkyTone, a collaboration between Kelsey Mines (bass, composition) and Carlos Snaider (guitar, udu, composition). Rhythmic possibilities in flow, cycle, and song. Grounding sounds of bass/percussion mixed with the subtlety of strings and voice informing the dialogue. Dance of/in/for the present moment. EarthToneSkyTone is a duo collaboration between Kelsey Mines (bass, composition) and Carlos Snaider (guitar, udu, composition). Rhythmic possibilities in flow, cycle, and song. Grounding sounds of bass/percussion mixed with the subtlety of strings and voice informing the dialogue. Dance of/in/for the present moment. One of Seattle’s longest running jams, now hosted by Eric Verlinde. Kelsey Mines is featured in this week’s rotating house band. The jam has a tradition of playing jazz standards in sometimes nonstandard ways. Always pressing forward while paying respect to the greats before us. The Femme Fatales in "A Touch the Femme"
Doors at 8:30, show at 9:00. Tickets are $18 and can be purchased at https://christinafemmemarch8.brownpapertickets.com/. Let The Femme Fatales lead you on a journey of multifaceted feminine power. With songs ranging from silly to sensual, you will find yourself laughing, blushing, singing along, and unable to forget. Every evening could use a Touch of the Femme. Royal Room Event Listing here. Gail Pettis vocal, Bill Anschell piano, Jeff Johnson bass, Mark Ivester drums, Dmitri Matheny flugelhorn. Gail Pettis vocal, Bill Anschell piano, Jeff Johnson bass, TBA drums, and Dmitri Matheny flugelhorn.